farnovision: Now You, Too, Can Have A "Farnsworth"
Now You, Too, Can Have A "Farnsworth"
QMx will be pre-miering the first piece in the line, The Farnsworth, at San Diego Comic-Con this week. 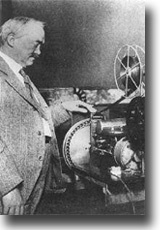 The Farnsworth is a video communicator that uses secure link that only another Farnsworth can decode. Two prototypes will be on display at San Diego Comic-Con: an exact replica of the hero prop with gray screen and an “idealized” version with more detailed weathering and a realistic, semi-transparent screen. 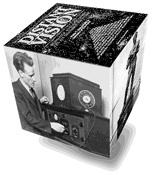 When you look at product they've developed, this "Farnsworth" communicator (what is this, a 'steam punk' iPhone? ), you'll see that it displays all the original graphic logo elements from Farnsworth Television and Radio Corp in the 1940s. The script "F" - like you see at the top of the page here - and the name "Farnsworth" imbedded in the face of the device, are all taken directly from the corporate logo that first appeared in 1938. Of course, the company was folded into ITT in 1949 and never heard from again, so all the trademarks have all long since lapsed. If this was, say, General Electric, there's no way they could get away with that sort of trademark infringement. But there is no longer any Farnsworth company to defend these IP assets. 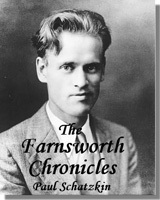 So in this 21s Century, Philo T. Farnsworth -- this obscure, forgotten and neglected inventor-hero from the 20th Century -- has been consigned to the public domain. Now screen writers like Aaron Sorkin can take all the creative license they want (to the point of changing indisputable historical facts). And TeeVee producers, while finally giving the man the credit he is due, are free to appropriate other aspects of his historic legacy -- in this case, the logo of his long-defunct company -- and exploit that asset entirely for their own benefit. Only in America. What a country. So, sadly, the injustice continues. Maybe it couldn't be any other way. I know the family has waited a LONG time for this recognition. It's just unfortunate that, like television itself, it has arrived in a way that provides no benefit whatsoever to the estate. Philo belongs to the ages now. So yes, starting next week at the Comic-Con, you can order your own Farnsworth (I wonder if the lines will be anything like the lines for an iPhone?). But you still can't have a "Farnovision." I've got the only one of those. Well, one of the few, anyway. 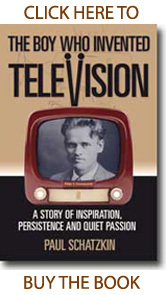 Did Farnsworth ever think of making a two-way version of television? One more thing: I'm writing a series of stories called "New Albion" featuring a school founded by one fictional character (Proctor Reynolds) and seven real ones. (Thomas Edison, Albert Einstein, PHILO FARNSWORTH, Joe Meigs, David Schwartz, Nathan Stubblefield, and Nikola Tesla). Some time before, I needed to buy a building for my corporation but I didn't earn enough money and could not purchase anything. Thank goodness my father adviced to take the business loans from banks. Hence, I acted that and was satisfied with my student loan. 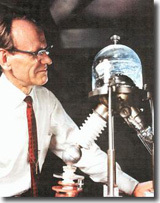 I want a Farnsworth. I bet it will fetch huge bucks at E-bay.